I reported earlier that our attempts to run the thiamine catalyzed 4-methoxybenzaldehyde (anisaldehyde) coupling to 4,4’-dimethoxybenzoin (anisoin) did not appear to generate any products. I ended up pouring all the student prepared reaction mixtures into a 1 L Erlenmeyer flask and let it sit in my research lab. One day towards the end of August I noticed that a drop of fine yellow crystals had formed in the flask. I recovered the crystals and put the filtrate into the refrigerator. Analysis of the crystals showed that they represented a single compound by GC-FID. MP 123 – 125 oC. UV λmax at 305 nm in dichloromethane. The IR showed a very weak C-H stretch absorptions and strong absorptions at 1655, 1597, and 1572. Proton NMR (400 MHz in CHCl3) shows 3 signals: 3.900 (singlet 6H), 6.974 & 6.996 (doublet 4H), 7.953 & 7.975 (doublet 4H). 13C NMR: 55.627 (CH3), 114.289 (CH), 126.408 (C), 132.363 (CH) , 164.972 (C), 193.481 (C). The third step of the modified benzilic acid synthesis project proceeded well under the same conditions as the benzil to benzilic acid rearrangement as outlined in a previous post. The products were characterized by melting point, UV absorption, IR, 1H and 13C NMR. The carboxylic acid products were not compatible with the GC column we were using. An interesting phenomenon was observed in the IR. Apparently, the alcohol group of (dimethyl)benzilic acid gives and uncharacteristically sharp peak at 3399 cm-1 which is also observed with (dimethyl)benzoin. The second part of the modified benzilic acid synthesis project was as straightforward as the first part was complicated. The quantities of ammonium nitrate for the copper(II) acetate catalyzed oxidation were adjusted for the different molecular weight of the starting material. Other than that conditions were the same as for the benzoin to benzil transformation. The great part about this step is that both the 4,4’methybenzoin and deoxy 4,4’methybenzoin were oxidized to 4,4’methybenzil. The products were obtained in good yields and the crystals were generally “fluffy” and easily handled. IR, UV, GC-FID and NMR analysis were performed. Benzil analogues have be studied as carboxyesterase inhibitors. 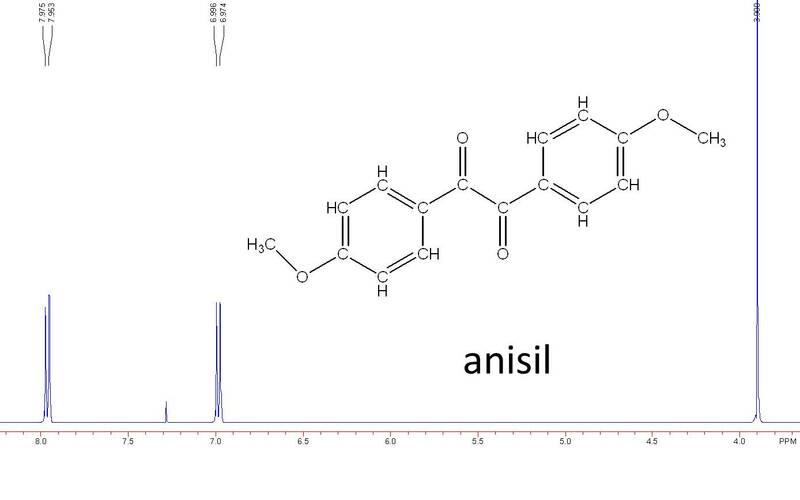 Identification and characterization of novel benzil (diphenylethane-1,2-dione) analogues as inhibitors of mammalian carboxylesterases. Inhibition of carboxylesterases by benzil (diphenylethane-1,2-dione) and heterocyclic analogues is dependent upon the aromaticity of the ring and the flexibility of the dione moiety. The thiamine catalyzed coupling reaction of 4-methylbenzaldehyde created an off-white solid product. Upon analysis the product contained one to three different peaks in the GC-FID that corresponded to the coupled products. After the oxidation step was completed, one of the three peaks remained. 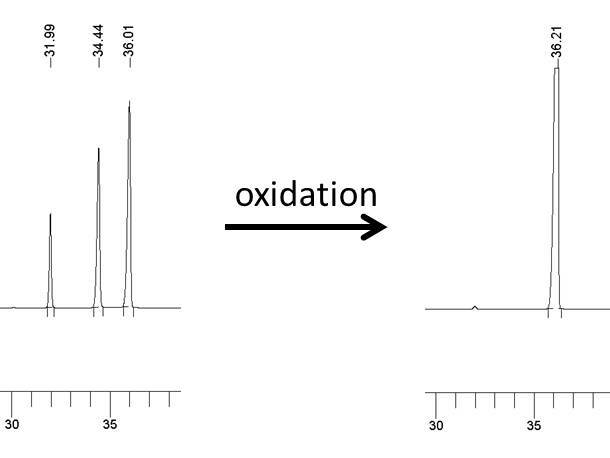 It is reasonable to conclude that the peak after oxidation was 4,4’-dimethylbenzil. It is also reasonable that one of the three peaks is 4,4’-dimethylbenzoin. The GC-MS confirmed this assumption. One peak was a C16H16O2 (240 m/z) and another at C16H14O2 (238 m/z). The third peak was at 224 m/z which could correspond to C16H16O. 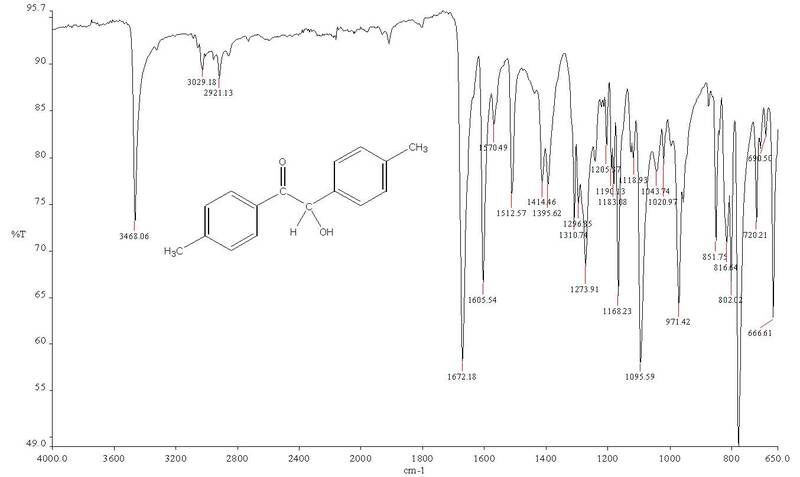 With proton NMR mixed samples had a peak at 4.236 ppm which was easily distinguished from the sp3 methine of 4,4’-dimethylbenzoin which shows up at 5.924 ppm. Carbon NMR of mixed samples had a C/CH2 peak at 45 ppm which was easily distinguished from the sp3 methine of 4,4’-dimethylbenzoin which shows up at 75.8 ppm. The only reasonable explanation for the third peak was 4-4’-dimethyl deoxybenzoin [1,2-di(4-methylphenyl)ethanone]. We set up the condensation reactions with the same molar quantities and under the same conditions as we had done the thiamine catalyzed benzoin reactions as few weeks before. It soon became apparent that the condensation of anisaldehyde was not occurring to any extent and the condensation of tolualdehyde was occurring much slower than it had with benzaldehyde. Heating the tolualdehyde reaction mixture to 60 °C seemed to speed up the reaction enough so that about a 50% conversion could be realized in a week. The anisaldehyde reactions were a bust and everyone switched to tolualdehyde. It ended up that the tolualdehyde reactions were incubated from 5 to 14 days at 60 °C. The toluoin did not crystallize from the reaction mixture in the same way that benzoin had, so it was extracted with ethyl acetate. The thiamine remained in the aqueous phase but the unreacted tolualdehyde crossed to the non-aqueous along with the toluoin product. We are able to crystalize toluoin from the resulting extract with ethanol and methanol. Crystalizing a product that contained significant amounts of impurity was a challenge. In most cases the crystallization had to be done several times and the (re)crystallization solution had to be cooled to less than zero Celsius to form crystals. The resulting dimethylbenzoin had a lambda max of 256 nm in ethanol. You will notice in the IR spectrum that the alcohol peak of 4-4′-dimethylbenzoin is quite sharp. Wait, we are not done with this yet! GC revealed that the recovered solid products contained a mixture of up to three products. I wanted to do a variation of the Benzaldehyde to Benzilic Acid synthesis as our final project. The premise was simple: We would use derivatives of benzaldehyde for the reaction. This is a common way to explore synthetic reactions. Many articles that feature synthetic reaction have dozens of experiments done by varying the structural characteristics of the reactants while retaining the same reactive functional group. I found that 4-methoxybenzaldehyde (p-anisaldehyde) and 4-methylbenzaldehyde (p-tolualdehyde) were inexpensive benzaldehyde derivatives. Coupling these reactants was not totally unknown in the literature but data was a little scarce. The self-coupling product of 4-methoxybenzaldehyde was called anisoin or 4,4′-dimethoxybenzoin. The self-coupling product of 4-methylbenzaldehyde was called toluoin or 4,4′-dimethylbenzoin. James and Ippolito in an article entitled “Rearrangement of p, p’-Disubstituted Benzils” refer to two articles written in the German in 1881 and 1889 for their synthesis of 4,4′-dimethoxybenzoin and 4,4′-dimethylbenzoin respectively. Shacklett and Smith in “The Preparation of Substituted Benzilic Acids” refer to the literature synthesis of both of these compounds as well. Apparently, the 4,4′-dimethylbenzoin synthesis was done with the potassium cyanide catalyzed benzoin condensation methodology. Sumrell, Stevens, and Goheen in “Benzoin Condensation of Anisaldehyde” use potassium and sodium cyanide as a catalyst. Xu et al. in “Efficient and mild benzoin condensation reaction catalyzed by simple 1-N-alkyl-3-methylimidazolium salts” report on the synthesis of 4,4′-dimethylbenzoin. The second step of the benzaldehyde to benzilic acid synthesis is the oxidation of a benzylic alcohol to a ketone. This oxidation could likely be effected by dozens of different reagents. Some of the early experiments do this step with nitric acid. This seems like overkill. An alcohol in that position should be easily oxidized. Most recent experiments do this step with copper(II) acetate, ammonium nitrate, and acetic acid. The origins of this reaction can be traced back to a 1948 J. Am. Chem. Soc. article by Marvin Weiss and Mildred Appel. This reaction shows up in Journal of Chemical Education in 1988. I found one source that uses vanadium(V)-oxychloride as an oxidizing agent. The reaction is heated under reflux and once it is cooled the crystals of benzil crash out of solution. The light yellow benzil can be recrystallized with 95% aqueous ethanol. The disappearance of the alcohol can be verified by IR and/or NMR. UV-vis spectroscopy is also useful with these reagents. Benzoin has a lambda max of 247 nm and benzil has a lambda max of 259 nm in ethanol. Of course, TLC is helpful in monitoring the reaction. The so-called condensation of benzaldehyde to benzoin was originally performed with a cyanide catalyst. The origins of this reaction go back as far as an 1832 report by Wöhler and Liebig. The reaction can be performed in a biomimetic manner with thiamine as a catalyst under basic conditions as proposed by Ronald Breslow in a 1958 article in the Journal of the American Chemical Society. In the undergraduate laboratory curriculum, the reaction mixture is prepared during one laboratory period and worked up during the subsequent session. Workup involves simply filtering the solid benzoin from the reaction mixture and washing it with cold water and/or methanol. We performed the synthesis in parallel with the previously described Diels-Alder reaction which also requires two laboratory sessions for completion. The amount of thiamine catalyst that is used seems considerable since it is a fluffy white substance. Experimental notes usually state that the thiamine catalyst is likely to be susceptible to degradation by extremes of pH and heat. Some reactions call for heating the reaction at 60 °C to initiate the reaction. The reaction features the rather dramatic formation of a white solid from a transparent yellowish reaction mixture. The reaction appears to be quite robust. Typically, recrystallization is not recommended for this step. The following posts report on the three step synthesis of benzilic acid from benzaldehyde. The first step is the conversion of benzaldehyde to benzoin using a vitamin, thiamine, as a catalyst. In the second step, the benzoin is oxidized to benzil through the use of an oxidizing agent. The third step is the preparation of benzilic acid from benzil via a base-catalyzed rearrangement reaction. There are at least three alternatives to the third step: 1) the reduction of benzil to hydrobenzoin (1,2-diphenylethane-1,2-diol). 2) the condensation of benzil and 1,3-diphenyl-2-propane to form tetraphenylcyclopentadienone. 3) the condensation of benzil and diamine to form benzil quinoxaline. Performing multistep syntheses in the undergraduate laboratory stresses the importance of obtaining a sufficient yield in one step to use as starting materials in the next step. A multistep synthesis is also economical because starting materials are produced rather than purchased for two of the three steps. For this particular synthesis, the atom economy for each of these three reactions is quite high. In this case, all three products are crystalline solids which can be characterized by melting point and other analytical methods. All three products can be obtained commercially as well. The reactions featured in the first and third reactions are not usually covered in Organic Chemistry curricula. The mechanisms can be easily portrayed by arrow pushing, however.